Avril Lavigne Attacked by Fans At Concert in Brazil - Black Star Concert that was held in Brazil, Tuesday, August 2, 2011, bringing impression for Avril Lavigne. When was the song "Fix You" belongs to Coldplay, Avril was suddenly attacked by a fan. Luckily the incident did not make Avril injured. The reason, several security guards swiftly securing Avril directly so they know there's a hysterical fan who ran towards the singer of "Smile" was. "Just something happened here," said Avril is trying to control the situation after several officers to secure the fans. "Okay, let's do it again." 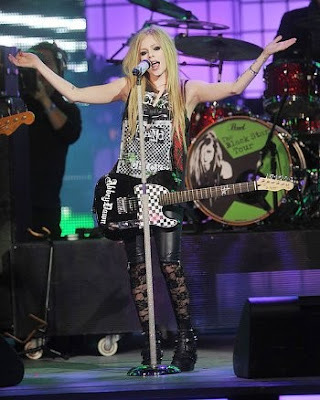 After holding concerts in Brazil, Avril will travel to St. Petersburg and Russia on September. Then, she will continue her trip to Europe for a gig in Italy, the Netherlands and France.